The churches of Venice are one of its artistic marvels. Few Italian cities have quite the same concentration of churches and almost every church in Venice has at least one top-level artwork, a Vivarini, or a Carpaccio, or a Veronese, or a Tintoretto, or a Tiepolo. 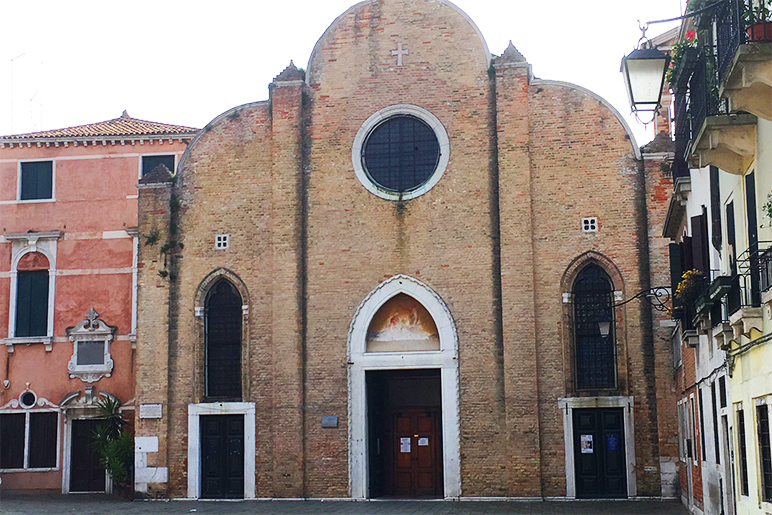 My favourite church in Venice is San Giovanni in Bragora, located in the sestiere of Castello. It was founded in the seventh century by Saint Magnus. In 817 it was remodelled by Giovanni Talonico and two further restorations took place in 1178 and 1475. Two very famous Venetians were born in the parish of San Giovanni in Bragora and baptised in the church. The first was Pietro Barbo (1417–1471) who went on to become Pope Paul II, and the second the famous composer Antonio Vivaldi (1678–1741). San Giovanni in Bragora also has some stunning art. There is a fine Madonna with Child and Saints by Bartolomeo Vivarini (1430–1491) next to paintings by his nephew, Alvise Vivarini (c. 1450–c. 1505). I am fascinated by the fact that these two men new each other and would have known, critiqued, and discussed each other’s work. The older man’s paintings are decidedly late Medieval, many being set in heavy gold frames, while the younger man’s work is renaissance in character. So here, in one generation, you see one of the most important stylistic changes in the history of art consciously taking place. You can find the work of the Vivarini family all over Venice. Alvise’s father (and Bartolomeo’s brother) Antonio was also a fine artist. They came from Murano, the island today associated with glass production. Another stunning work of art in the church is the altar piece by Cima da Conegliano (1459–1518) depicting the baptism of Jesus Christ. The naturalistic scene in the bottom half of the painting is complemented with several multi-coloured angel heads above, peering out of heaven to witness the scene along with the Holy Spirit in the form of a dove. The colour of the sky is, for me, one of the most exquisite things in the whole of Venice. What’s your favourite church in Venice or any other Italian city? San Niccolò dei mendacoli is my favorite. I love the ceiling, how cozy it is, and the back porch where the nuns would sleep (if I was told correctly!). It’s a lovely church, isn’t it? The ceiling is amazing. There are just so many fabulous churches in Venice. Per me, il favorito e Ciexa San Giovanni Crisostimo, ma anche mi piace Santa Maria Formosa–due ciexa di Mauro Codussi. Ma e vero: San Giovanni in Bragora e speciale. San Giovanni Gristostomo e Santa Maria Formosa sono per me tutti e due importanti per vari motivi. Sono bellissime! You do. She never changes and the light and colours are always stunning. Even the colour of the canal water changes depending on where you are in the city.